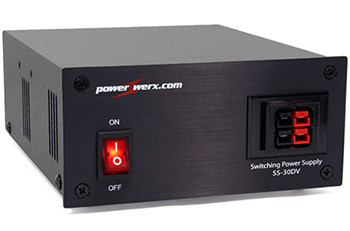 This small regulated switching power supply features 2 Powerpole® outputs in front and 1/4" binding posts in rear. Machined metal front bezel with illuminated power switch. DC output voltage 14.1V (adjustable via internal pot) at 25A continuous, 30A surge (up to 5 minutes). Small 6x5x2.5" footprint. The Powerpole® connectors mounted on the front panel conform to the RACES/ARES standard orientation. Connect the power cable's positive (red) wire to the positive terminal and connect the negative (black) wire to the negative terminal on the back of the power supply or use the Powerpole® connectors mounted on the front panel. Turn the power supply on by pressing the power switch to the 'ON' Position. Before you turn the power supply off, turn the radio off as described in the user documentation for the radio. Then turn the power supply off by pressing the power switch to the 'OFF' Position. The SS-30DV power supply is cooled by convection and forced air cooling (normal airflow around the power supply in combination with a temperature controlled fan to improve cooling at higher levels of use). The fan is activated by a sensor when the temperature rises above 70 °C. The SS-30DV has a three-year limited warranty. We will repair or replace (at our discretion) your SS-30DV if you encounter any problems within three years from the date of purchase. We reserve the right to charge a reasonable fee for repairing units with user-inflicted damage. It is your responsibility to ship the defective unit back to Powerwerx. We will pay for the return shipping back to you. We reserve the right to upgrade your equipment to an equivalent or better model.